Sometimes Hindemith has gotten a bad rap--mostly because at the end of his life he did not adopt serial composing techniques. These days that matters not at all. Perhaps it even shows gumption. Hindemith was a composer who was thoroughly a modern part of his times but preferred to follow his own muse. And so much the better for us, his present-day listeners. 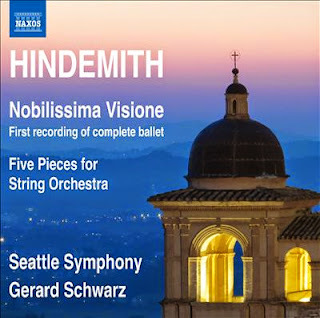 I've covered a fair amount of his music on these pages, but today there is something a little special, that is the first recording (by Gerard Schwarz and the Seattle Symphony) of the entire ballet Nobilissima Visione (Naxos 8.572763). I still have a scratchy old Angel LP of Hindemith conducting "Symphonic Dances", an orchestral suite excerpted from the full ballet score. This version is the one that has been available on recordings thus far. Though it is fine music it is about half the length of the full ballet, which runs at about 44 minutes. And that long version is what we get here. There is nothing superfluous to be heard. It all works together and sounds whole and organic. The ballet has something of a complicated genesis. Hindemith had the idea of a ballet based on the life of St. Francis of Assisi after he and Leonide Massine met in Florence to discuss a possible ballet collaboration--this was in May of 1937. Hindemith was inspired by Giotto's frescoes on the life of St. Francis that he saw while there visiting the church of Santa Croce. The images were so moving he decided to address something of the saint's life through dance. In its final, complete form it was premiered in London in December 1938. At the last minute on publication the title of the ballet was changed from "St. Francis" to "Nobilissima Visione". That is the basic story. The score is remarkable in its interweaving of early music folk-art song into the score, made into Hindemithian material by virtue of the composer's special stylistic synthesis which by then of course was fully mature. The incorporation is so subtle it is not obvious to the ordinary listener without score in hand. But nonetheless there is a lyrical element present at times which alternates with passages of tutti orchestral power and therein the pre-coached listener can find restatements of the themes involved. Schwarz and the Seattle Symphony do us a real service with their excellent performance of the entire work. They give it the full treatment, dazzlingly spectacular and tender at turns. As a nice bonus the disk gives us Hindemith's 1927 "Five Pieces for String Orchestra" which was a work designed for performance by young or amateur players to get an experience of playing music that was relatively easy to perform (all parts written in the first position) yet rather complex and chromatically modern. The "Five Pieces" are the final works in the series. With the first-class Seattle string section they totally convince as music that goes far beyond pedagogy. They stand on their own as serious music and typically early Hindemith at his best. So here we have a major event, a great recording of artistically and historically important Hindemith. Needless to say this is an essential Naxos release that nobody who follows the modern path can afford to miss. With the advent of the art form known as jazz from the early 20th century on, composers of varying backgrounds responded in the modern classical realm with works influenced by the music, with greater or lesser success. Scott Joplin was in ragtime a part of the music itself but also did more classically oriented works such as the opera Treemonisha. James P. Johnson experimented in the classical realm, though he was primarily a jazz original of great importance. Then there was George Gershwin, and a host of others, including Milhaud, Stravinsky and on. Because the clarinet in the first half of the century was one of the primary instruments in the music, many works called for clarinet soloing of a virtuoso nature, solo roles that encapsulated some of the jazz feelings of improvisers yet were firmly planted into the soil of the particular composer's personal vision of a hybrid sort of music. Clarinetist Gary Gray has drawn upon such music, both early and later, as a springboard for his solo album Shades of Gray (Centaur 3251). It is not 100% a jazz-themed album, but the influence on various composers is never far. We get some of the staples of the repertoire, such as Gershwin's "Three Preludes" (1927) which is adapted for clarinet and piano. Similarly Gary and Bill Cunliff do a clarinet-piano adaptation of "Rhapsody in Blue" (1926). From there we get a pleasing potpourri of works, some rearranged classics like Billy Strayhorn's "Lush Life" (but the Hartman/Coltrane version was so definitive it seems less critical to recite the lyrics here), Jobim's "Wave" and such. There is also Kenny Burrell's "Blue Muse", which fares well. And then there is greater-or-lesser inflected jazz-meets-contemporary-classic works by Gernor Wolfgang, Mark Carlson, Charles Harold Bernstein, and Bill Cunliffe. Gary Gray's clarinet is exemplary, the program is filled with good things, all in all, and time goes by swiftly when you are under the spell of the music. 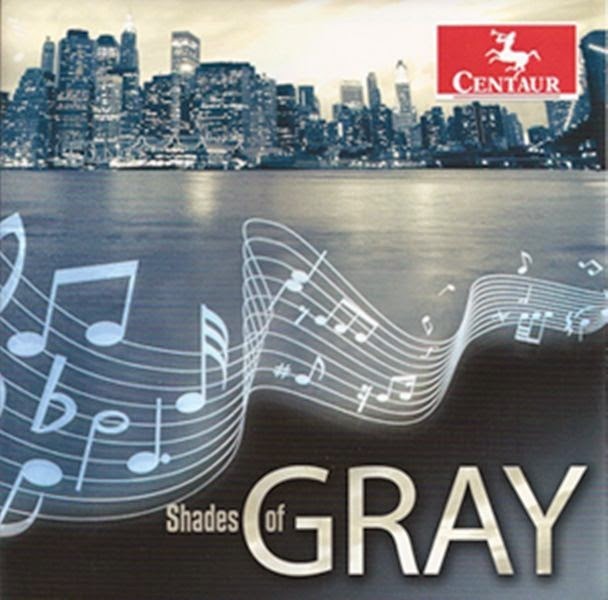 As long as one keeps in mind that this is jazz seen from a modern tonal classicist's side of things (and Gray has an excellent feel for this end of the hybrid) you will find much to appreciate and like. This is classical modern music with jazz influences; it is not exactly jazz per se! And so what? It gives you a nice selection of such music, played well. The avant garde world keeps turning. It doesn't stop. 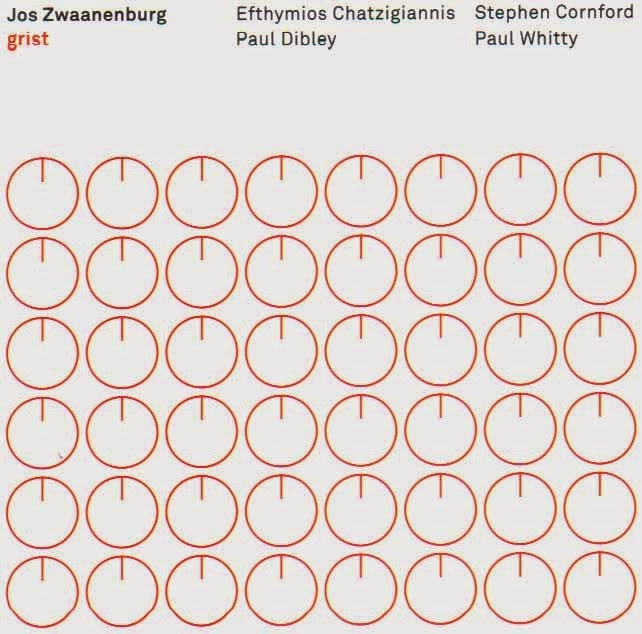 Flautist Jos Zwaanenburg reminds us of this via his new anthology of music for flute and electronics, Grist (Metier 28542). We get five provocative, sometimes noisy, cutting-edge works, each defining the new terrain in its own way. Efthymios Chatzigiannis presents "Broken Mirrors"; Paul Whitty gives us two compositions, "Does the body rule the mind or does the mind rule the body" and "Has the world changed or have I changed? "; Stephen Cornford chimes in with "Flute Feed", and Paul Dibley gives us "Organ Grinder". Some works are more obviously flute-full, some more overtly electronic. "Broken Mirrors" combines flute improvisations with a program that in turn responds to those passages. 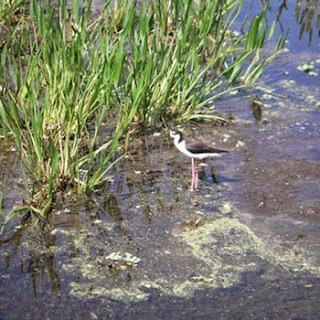 "Flute Feed" makes use of aleatoric elements in the interaction of flute, resonating piano and digital feedback. "Organ Grinder" uses live flute, sampling, live electronics and computer generated sound. Paul Whitty's two works are densely thick, noisy electronic montages that create a thicket of original sound that is not to be denied, yet fascinates thoroughly in any event. These are all works that bear study and close listening. Jos Zwaanenburg has an integral role to play here and he does it with a kind of selfless devotion to the compositional demands of the moment. He shines forth when called for in ways we can admire and at other times he gives the impetus for the evolving shape of a work with creativity and sensitivity. This is not so much a flute tour de force as a set of interactions of Zwaanenburg and electronics. It bears repeated listens. State-of-the-art live and interactive electronics are the order of the day. Well worth hearing. One composer's drone is another composer's melodic center. It depends on context. Music which uses long continuous tones and hearkens back in some way to classical Indian music tends to use the long tones as an anchor to something that either does or is expected to occur overtop, even if that "something" never quite comes to bear on the music. On the other hand Robin Hayward's Nouveau Saxhorn Nouveau Basse (Pogus 21077-2) uses long tones in a different way. The album at hand today contains three pieces. Each uses long tones on the microtonal tuba, an instrument Robin Hayward conceived of using six valves, allowing for standard plus microtonal soundings. He plays the instrument on all three works. "Plateau Square" utilizes the instrument with a four-speaker sound system. Each speaker reproduces sound aspects in an individual plateau of pitch relationships. I wont attempt to explain it; indeed I am not entirely clear what is meant in the liner notes. Suffice to say that long tones correlated in pitch to a particular plateau are the basis for the work. "Travel Stain" combines long tones on the microtonal tuba plus a guitar part realized by Seth Josel. The guitar notes, mostly plucked harmonics, accentuate the long tones. There is an elaborate hexagonal notation with tone sequences that the instrumentalists explore one-by-one. "Nouveau Saxhorn Nouveau Basse" returns to solo microtonal tuba. Subtitled "Elegy for a Failed Instrument", it centers around a horn invented by Adolpho Sax, with six valves that were configured to avoid the need for the instrumentalist to combine multiple valve stops. All tones were produced by depressing one valve at a time. It never caught on. Hayward combines his microtonal tuba (which also uses six valves but in different ways, including combinations) with a seven-speaker sound system. To honor the memory of the instrument Hayward conceives of a tuning-note sequence that utilizes long notes produced by only one valve at a time, with six speakers each devoted to the notes played by depressing a particular valve. The seventh speaker is located backstage and represents the bell of the saxhorn. What counts is the sound of the notes and their overtone development as the tones interact with the aural playing space. The piece creates eerie harmonies via a system of multiple trackings that gives the work an acoustic-electric ambiance and fullness. All told this is music that creates its own space. And you do not need to understand fully or even partly the theoretical underpinnings that went into the works to appreciate the sonorities that are produced. In the end there is an aural poetics at play. Hayward has his own kind of rigor which we can appreciate for its existence--and then set aside and appreciate the music in its full utterance. It's haunting and moving music! Some music, every time you hear it you notice new things. That was and is true of Markus Reuter's Todmorten 513, reviewed here last month. And no wonder. The work is almost like a musical Rorschach test--you hear what's there but your mind selects from all of it each time, beautifully so. So, Lewis Spratlan. His music on the Boston Modern Orchestra Project album is packed with so much detail, there is so much there, that you keep noticing more to like as you go. The three works are multiplex stylistically but they hang together well in various ways. There is "A Summer's Day" (2008), which fits well with what we in this hemisphere are experiencing right now, myself included. Each movement is descriptive of summer and its experiential moments, culminating in "Serene Evening, Soft Breezes, Crickets, a Distant Storm" (movement seven) and "A Starry Night" (movement eight). Beautifully descriptive orchestral writing and very copiously elegant event periodicity are very much what we get. Ives in thickness at times. Other times, something else altogether. But always contentful. The "Concerto for Saxophone and Orchestra" (2006) features Eliot Gattegno on soprano and tenor sax, well-played. It too has a periodic feel, with jazz inflections, rhapsodicity and modernity rubbing three hands together in fascinating episodic ways. 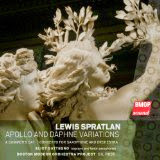 The title work, Apollo and Daphne Variations (1987) comes out of a disarmingly, deceptively simple waltz tune Spratlan put together in the context of discussing Schumann's alphabet motifs in a composition class. It grew into a full-blown and vary varied set of variations. It's all good. Gil Rose conducts the Boston Modern Orchestra Project with verve and understanding and the orchestra responds accordingly, idiomatically. You'll find a wealth of musical modernity and a lyrical tunefulness in these works. They stand out by taking form gradually and then implanting themselves in your musical memory, bit by bit. Emphatically. I love the music! You may feel the same after some listens, even if you are having those 21st century traumas that beset many of us today. A sure antidote is at hand on the Apollo and Daphne Variations disk. Not every modern electro-acoustic/electronic composition jumps out at you like a jack-in-the-box. Some works say what they want to say in slowly unwinding narratives, so you have to open up and concentrate over time to get what the composer intended. 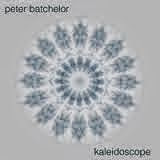 That's how Peter Batchelor's series of works collectively known as Kaleidoscope (Pogus 21073-2) plays out--slowly. There are five segments in all, four in the "Kaleidoscope: Cycle" and one in "Kaleidoscope: Arcade". They were composed for eight-channel playback and the set comes with a DVD that allows for that (or for that matter 5:1). The CD gives you a two-channel version. The various sections were composed between 2004 and 2013. It is a music of silence and sound, the sound being mainly unpitched event fragments with some recognizable but electronically transformed pitched elements entering into the segments at seemingly critical junctures. It is music for the long-haul, long-formed unfoldings of abstract sound, some of it rather quiet, all of it less performative than discursive, a thoughtful conversation of sound between aurally transformed sound materials. The multi-speaker DVD version brings out the discursive give-and-take of the music more dramatically, but the two-channel CD version brings it together in ways that remain comprehensible. I won't say that this is my favorite electronic work this year. It is a work that I need to hear more. There is a particular complexity that does not readily avail itself to you without study, close listening in an undistracted environment. Give Kaleidoscope that attention and you will begin to feel its importance. That is saying something. 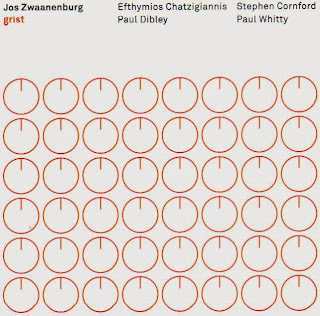 Whether this is "great" or only extraordinarily interesting (which is enough) I have not decided. Time is necessary! Give a listen and decide for yourself. On March 16, 2012 I reviewed favorably Patricia Morehead's Good News Falls Gently on these pages. 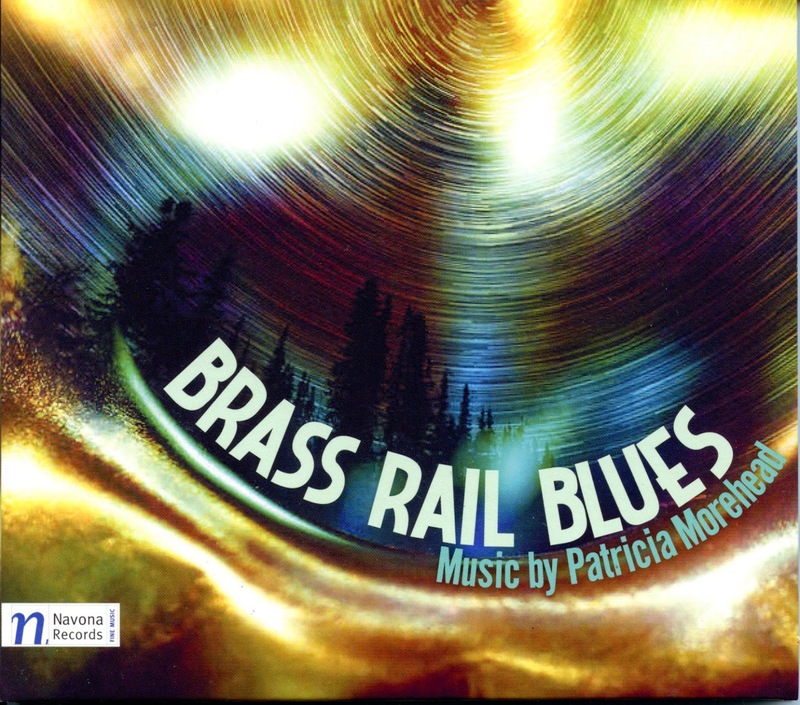 Today we have her second album, a collection of mostly songs entitled Brass Rail Blues (Navona 5953). It is music of a gestural modernism that works within an advanced harmonic palette that approaches atonality but generally stays within key centers one way or another. The works for voice and instruments are situated within a chamber setting. "Alaskan Songs" features mezzo-soprano Julia Bentley plus clarinet and piano, "Three French Songs" has Bentley again with piano accompaniment, "Sempre un Giorno Nuovo" spotlights soprano Alicia Berneche with piano, "Two Movements from Tryptich" gives us Susanna Phillips in the soprano role plus string quartet, and "The Wonderful Musician" encores Julia Bentley with the CUBE Chamber Orchestra. The latter is a work of real modernist power. The pieces in song form have an edgy quality and well-conceived phrasing sequences that convey the emotive impact of the texts. Interspersed throughout the program are several instrumental works: "The Edible Flute" for flute and piano, and "Just Before the Rain" for mandolin, cello and clarinet. The latter I particularly like for its lively sound color contrasts between the instruments. These are works of substance. Patricia Morehead has a sure sense of instrumentation, a flair for vocal writing and text setting, and a modern expressionism that wears well with repetitive auditions. "Brass Rail Blues" from Tryptich has an Americana favor, bluesy yet straying nicely into modern harmonic territory. There is much to like in this program. Patricia Morehead gives us more reasons why she is a composer of today, someone to follow with interest. Recommended. What is possible in today's music is nearly endless. So today we have one possibility of many, a good idea realized with virtually every nuance you might expect in such an encounter. It is the interaction of a composer-musician of the West with a Chinese stringed instrument that goes back to antiquity, namely the Chinese instrument known as the qin. The qin is something akin to the Japanese koto, for a quick analogy. Its sound, when combining different techniques--the harmonics, sounded notes and slides, has a feel perhaps more intimate than its Japanese counterpart. 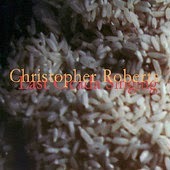 So what we have is Christopher Roberts in a 30-minute recital of his new music for the solo qin. It uses the alteration of sound and brief silences as does traditional Chinese music for the instrument but the musical content has more to do with western "radical tonality", new music with a key center but otherwise a unique postmodern take on how tonality can play out. All this on the Cold Blue EP CD Last Cicada Singing (CB0034). Like traditional Chinese music for the instrument which uses gestural phrasing to convey nature as an art form, the title piece especially but all the works presented here make direct reference to such concerns. The entire album has a meditative cast that manages to convey nature in its unassuming presence as felt by the solitary maker of musical sounds. The album is filled with a kind of quiet luminosity hard to resist for those used to concentrated listening. It is not perhaps what you expect of Western new music, but that in itself is of significance. Christopher Roberts gives us a rarefied glimpse of music-in-being that may well become a favorite for when you are in the mood to get inside the quietude of nature. Highly recommended. Can you imagine being composer John Garth (1721-1810), organizing a bi-weekly series of concerts in Durham city, England, where he achieve some modest fame as composer and cellist? When he wrote his Unaccompanied Keyboard Sonatas, op. 2 & op. 4 (Divine Art 2-CDs 25115), he of course hoped for good performances, a good turnout and a favorable reception. But could he have hoped, some nearly 300 years later, that someone such and you or I would get a chance to hear the sonatas again in recorded form? Could he scarcely imagine some such possibility or had he no thoughts of all of the possibility of posterity? I have no answer to this question yet here I sit at my computer typing these lines in 2014, listening to the very music he wrote back then. 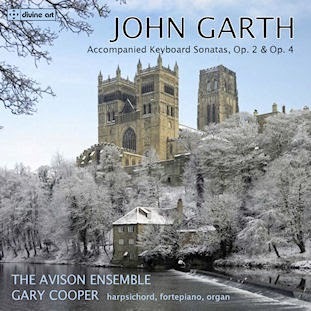 John Garth was no CPE Bach, certainly, yet there is a period flavored freshness and vivacity to these works, as nicely performed by the Avison Ensemble with Gary Cooper as keyboard soloist on the harpsichord, early fortepiano and organ. He is chiefly known for these works, the cello concertos and a few similar pieces, much of it available on Divine Arts as played by this ensemble. What it certainly does is opens you up to the lesser-known English composers of the era. John Garth was no slouch. On these sonatas the keyboard part is far more the out front, virtuoso vehicle for Garth's ideas. The two violins and cello that form a part of the music have the role chiefly of reinforcing the accompaniment figures and seconding the solo melodic line. This is more rococo and jaunty than deeply contrapuntal or gravitas. That was the age and he excelled at the rather happy extroversion of his times. The individual tang of early pianoforte instruments, harpsichord and organ help individualize each sonata and give it character. The ensemble plays these pieces with enthusiasm, an infectious sort. I found myself listening with pleasure each time. Anglophiles of the music of this period will respond readily. But I suspect anyone with an interest and appreciation for the earlier forms will feel positively about the program and its performance. Good show! If I were Joseph Haydn, and of course I am not, one of the toughest assignments would be to set very periodistic folk songs to music in my own way. Why hard? Because there is such an a-b regularity to some of them that I would be hard put to add as much in the way of nuance as I could, basically transcending the rather rigorously symmetrical melodic structures of the songs as something beyond a straightjacket to my natural inclinations for development. 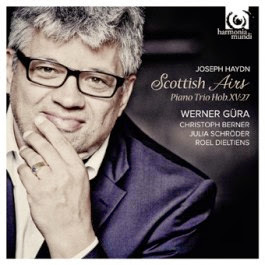 He faced something like that in his settings of Scottish Airs (Harmonia Mundi 902144), available in a nice rendition by Werner Gura and the piano trio of Christoph Berner, Julia Schroder and Roel Dieltiens. Perhaps Haydn welcomed the challenge late in his career (when these were created) because in essence all the subtlety of Haydn meets face-to-face with a ruddy-cheeked folk hardiness and both come out winners. The accompaniment to the straightforward vocal parts alternates between a earthy archaic quality and a worked-over sublimity that ultimately gives us a kind of friendly two-headed hydra. There is spirit and sublimity at times in these settings. All of it strikes a note thanks to the formidable vocal dramatics of Werner Gura and the well-turned, lovingly wrought piano trio performances. As a bonus and a refreshing break from the song form we also get an excellent Piano Trio in C Major Hob XV:27, the three movements coming in alternation between songs for maximum contrast. This may not be something indispensable to your collection, but it is exceedingly lovely and well performed. And Haydn devoted his considerable inventive skills to make it all rather ravishing. Recommended. We turn today once again to our off-and-on survey of releases on the Cold Blue label, which specializes in modern minimalism and radical tonality. 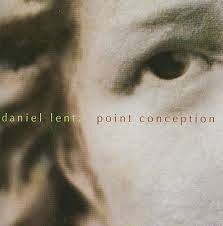 Daniel Lentz and his two-work multipiano offering Point Conception (Cold Blue CB0028) is what is at hand. Lentz will be known by many as one of the best of the second wave of minimalists. He comes through with flying colors on this one. The title work (1979) is the main event, with Arlene Dunlap realizing the nine piano parts. Each part calls for octave figures, which when played together gives you a kind of canonic sonics that has the flamboyance of a romantic piano concerto cadenza fragment as viewed under an aural microscope, evolving into masses of modulating, harmonically shifting clusters of sound that convey a kind of elation, and more a feeling of constant motion than repetition. The work builds to a rousing climax and one is left with a feeling of satisfaction at the originality, the flow of the work, the excitement generated. "Nightbreaker" (1990) follows, a shorter work for four pianos realized by Bryan Pezzone. It combines octaves, arpeggiations and cascading figures that modulate fairly rapidly. There are contrasting punctuation sections that break the flow and give you pause. It is a work of brightness and waterfall-like expressiveness. That in essence is what Point Conception holds in store for you. It is music to stimulate and delight. There are spectacular sonics to be heard here--a kind of multi-piano emblazonment, a heaven of keys and emboldened sounds. It will appeal to those who love the piano and seek something different. It will appeal to those who want a break from their usual fare. Recommended! Before the 20th century got underway in earnest, noise was something well-defined. It was sound refuse, the by-product of productive manufacturing, machines, people making a racket. It was undesirable sound. If the term were ever applied to music then it was generally in disparaging ways, with the notable exception of the biblical phrase "make a joyful noise unto the Lord", but that was intended more metaphorically than literally. If anyone has information or thoughts to the contrary they are heartily enjoined to add a comment at the bottom of this article. The Futurists early in the turn of last century got things started by sometimes incorporating noise elements into their sound-art assemblages. It has been a part of modern avant garde music making ever since, especially from the 1950's onward. Secluded Bronte is a three-person avant music collective that incorporates noise into their music events. Adam Bohman, Jonathan Bohman and Richard Thomas put together a series of recordings using an array of musical and homemade sound producing devices, from toy piano and cymbals to balloon horn and bottles. Then in a live broadcast on the free-format New Jersey radio station WFMU the sounds were disassembled and reassembled live in a collage mix broadcast for the Dave Mandl "World of Echo" show. Or at least that's how I gather the processed results were produced. 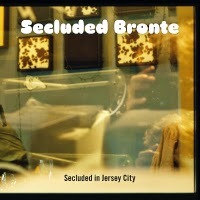 The final product, five collage tapes created by Adam Bowman, are contained in the 22 minute EP Secluded in Jersey City (Pogus 21075-2). It is avant music that operates in a middle ground between "pure noise" and "melifluous tone", or in other words much of the tone-noise produced has pitch as well as timbre, though nothing close to a melody line emerges. It is sound art that has something in common with John Cage's early tape collages from the fifties, in that there are endless sound combinations, much of it unpatterned, all of it of sonic interest. This may not be totally indispensable for that new music avantist, but it certainly grabs and retains interest, has evocative qualities that even the novice with an open mind may find interesting, and so may be something you might put on for someone who wants to know what is happening in avant music lately. The collage technique is not accompanied by a great deal of signal manipulation as much as radical re-sequencing, so there may be more of a sense of comprehensibility for an untrained ear. I do not know because I did not try playing this for my neighbors. What matters is the poetic qualities of the sound-noise-music. And that is at a high level for the duration of the CD. John Dowland's music often had a special melancholic mood to it, no more so than in his Pavans. Over his lifetime (1563-1626) and in that age in general there were others who wrote music that was tinged with a sadness that must have struck a nerve with the music audiences of the day. 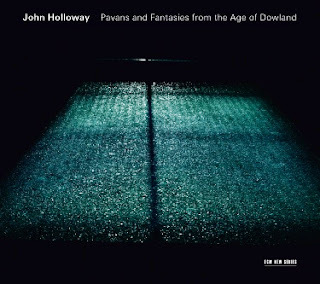 John Holloway's Pavans and Fantasies from the Age of Dowland (ECM New Series B0020796-02) gives us an entire program of characteristic music as composed by Dowland and his contemporaries. Violin-Violist John Holloway leads a string quintet through 13 relatively brief but quite moving pieces. The ensemble of strings led by Holloway is not typical by modern standards, but not necessarily out of place for the performances of these works in the original period. Much of the music was meant to be played by lute alone, or lute with strings, or strings alone. Holloway decided for a quintet of two violins/violas, two violas and a bass violin which suits the part-writing quite well and gives the music a somewhat darker tone than other possibilities would have done. For John Dowland's masterpiece, the "Seven Pavanes--Seven Teares" all four of the upper-range string players play viola, which are closer in range and tone to the violons of Dowland's era. Interspersed between these remarkable works are six works that more or less parallel the mood and fill out the program nicely. They are short, often equally melancholic works by Henry Purcell, William Lawes (2), John Jenkins, Thomas Morley, and Matthew Locke. The interspersing of other period works in between the Dowland affords contrast and makes for more dramatic re-entrances of the characteristic melody line that begins each Dowland Pavan in this series. In the end we get a beautifully sad Elizabethan, late-Renaissance evening of exquisite music, played with sensitivity and subtlety by Holloway's string consort. The music thrives with a pure, vibrato-less playing style that brings to the music a natural, pre-romantic balance that conveys feeling in a more contemplative, less exhibitionistic way than is typical of later periods. It is a very satisfying, convincing performance of music that combines a dark sorrow with a sweet-bittersweet aura that was perhaps unique to Dowland and the English school of his day. Holloway and his ensemble do the music total justice. Hearken and you will find much to appreciate! Paul Hindemith (1895-1963), as many will know, was an accomplished violist. He wrote a fair number of works which were designed to showcase his abilities and presence on the instrument while exemplifying his compositional style in a concert setting. 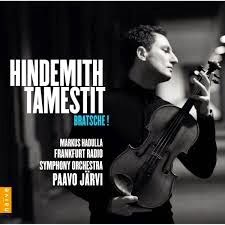 Violist Antoine Tamestit, with pianist Markus Hadulla and Paavo Jarvi conducting the Frankfurt Radio Symphony Orchestra, have gathered together some very exemplary Hindemith works for viola in the CD program Bratsche! (Naive 5329). Four works are featured, the "Sonata op. 25 no. 1 for Solo Viola", the "Sonata op. 11 no. 4 for Viola and Piano", and with the Frankfurt Symphony, "Der Schwanendreher" and "Trauermusik". A key here certainly is the excellent playing of Tamestit, who is especially good in these works, combining exceptional technique, singing tone and and committed enthusiasm. Markus Hadulla sounds right in his execution of the piano part for the "Sonata op. 11". Jarvi and the Frankfurt Orchestra give us a beautiful reading of the orchestral parts. The music covers Hindemith's pre-US period, 1919-1936, with the two orchestral works showing remarkable poise in the face of persecution by the Nazi government. All of these works are some of Hindemith's very finest. Hearing them played so well by Tamestit and company goes a long way toward realizing the Hindemith viola parts the way he might have played them at his peak, but also confirms rousingly what a brilliant composer the man was. This seems a perfect match-up. A beautiful set of performances that are highly recommended! 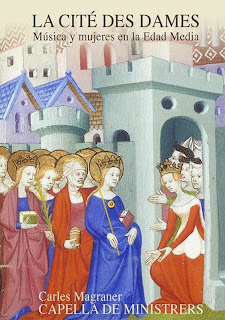 The unusually themed, beautifully produced album I have before me brings us a side of the culture and music of the Middle Ages we do not encounter often unless we are specialists on the period in relation to women. 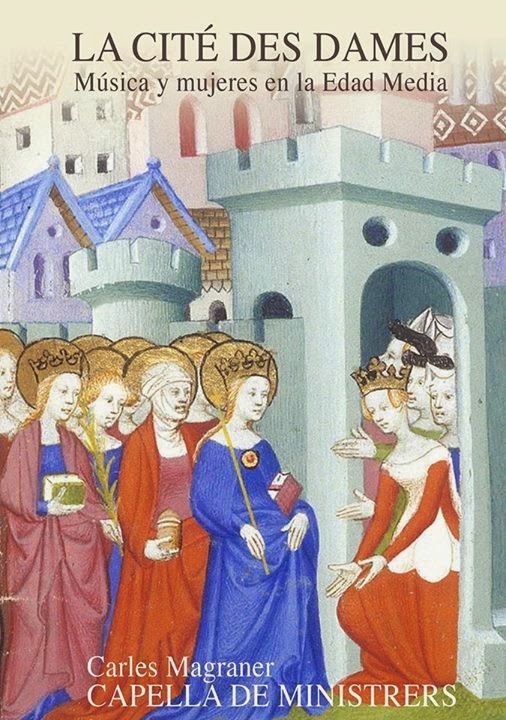 La Cite des Dames by Carles Magraner leading the Capella de Ministrers (CdM 1333) is based on the Book of the City of Ladies, a feminist utopia of sorts written by Christine de Pizan in the early 15th century. It was penned in reaction to the disparagement of women in medieval society as contained in philosophy and theology writings then current. She envisions a City of Women, where females of virtue and ability take on all the civil and cultural functions of a metropolis. The 2-CD set and nicely produced hard-cover booklet that accompanies it seek to recreate that female city, in paintings of the era and music sung by women, often written by women composers. This is music of the Middle Ages in modern performance practice, where the music is reconstructed with all-original instrumentation in what one may say results in a more folk-ethnic sound than was the case in typical recordings before around 1970. It is a series of sacred and secular music by Hildegard of Bingen and a host of woman composers whose names you probably have not heard of before: Herrada de Landsberg, Abadia de Fleury, Beatriz de Dia but then also Ana Bolena. There are some anonymous musical figures here and there as well but everything fits together convincingly as an imaginative musical portrait of a world where women do it all as well or better than men. This is memorable music performed with real period sensitivity by the Capella de Ministrers. Musical director Carles Magraner prepared the program with some care. The results are quite near magical. 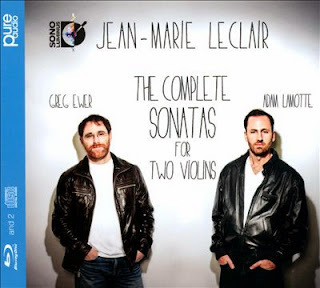 The baroque French music of Jean-Marie Leclair (1697-1764) does not have a great deal of currency or circulation these days, at least in my world. But after hearing the Greg Ewer-Adam Lamotte recordings of his The Complete Sonatas for Two Violins (Sono Luminus 92176 2-CDs and Blu-ray) I find myself gravitating towards his music, happily. The full set of sonatas takes up two CDs. The music is varied and lively. According to the liner notes it was during his stay in Italy, studying with Quantz and violinist Giovanni Battista Somis, that Leclair's music took a decisive turn. In those days, double- and multiple-stops were unknown to the classical violin in France. Leclair picked that up from Somis and absorbed the bravura style of the Italians in general, though the violin sonatas still show much of the refinement typical of the French school of the era. This you can hear to excellent effect on the sonatas. Greg Ewer and Adam Lamotte do a fine job performing the works. They capture the natural buoyancy of the music, giving us readings that are both sweet and dynamic. The combination of multiple-stops and the way the voicings are constructed bring you a full sound that forwards the perception of a larger group than is the case. The liner notes cue us to listen for that and indeed, you can readily hear it throughout. As with the bulk of Sono Luminus releases, there is a standard stereo mix (on the two CDs) plus a 5:1 version on a Blue-ray disk. Either way the sound is excellent. Those who appreciate spirited early music performances of works not well known will revel in this music. But the album affords a good deal of pleasure regardless of your background. It's an excellent set! Of all the contemporary jazz artists who have crossed-over to classical orchestral music and other large-scale forms, Anthony Davis is certainly among the most prominent, with multiple compositions, performances and albums going back decades. He also is one of the most original, with a style of his very own. I consider him among a small handful of the very best jazz composers working in classical configurations. Today we look at a recent release of some of his compositions for orchestra, Notes from the Underground (BMOP Sound) as recorded by the Boston Modern Orchestra Project under Gil Rose. I recognize a few of the themes in the earlier works here as having been part of a recording or two a long time ago, perhaps with varying instrumentation (?). But in any case those recordings are no doubt long out-of-print and the current versions are excellent, definitive. 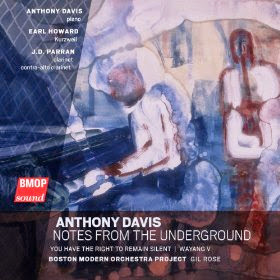 Anthony Davis's orchestral music incorporates a modern contemporary stance along with his own brand of minimalism (usually more akin to ostinato riffing from jazz than mesmeric or rhapsodic repetition) and jazz-rooted influences. The disk gives us three lively works: "Notes from the Underground" (1988) which adapts and transforms Duke Ellington's "Diminuendo and Crescendo in Blue" as a part of the orchestral dialog. It is dedicated to Ralph Ellison. "You have the Right to Remain Silent" (2007) uses the US Miranda arrest statement as a spoken, rhythmically developed speech-text that intertwines with jazz and orchestrally modern compositional dramatics. The work features in solo roles Earl Howard on synthesizer and J.D. Parran on clarinet and contra-alto clarinet. Finally "Wayang V" (1984) has a Balinese contrapuntal minimalist charge that conjoins with a jazz sensibility and gives the music an exciting edge. Anthony Davis appears as piano soloist. So that is about the size of it. The volume gives you some very representative Anthony Davis works in focused, burnished, dynamic fashion. It is an excellent introduction to the composer for those who don't know his music but it will be a welcome addition to the library of those who already appreciate Maestro Davis as well. Very recommended. Violinist Roman Mints gives us a program of works for solo violin with radiance and dynamic life. 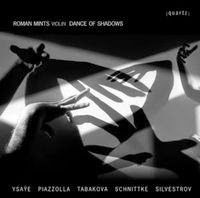 Dance of Shadows (Quartz 2103) covers selected composers in stylistic zones from late romanticism to the contemporary with the emphasis on the wide range of tonal colors and dramatic breadth that the concert solo violin is capable of today. Mints gives us careful but lively readings of Eugene Ysaye's "Sonata Op. 27 No. 2" (1928), Astor Piazzolla's "Tango - Etude No. 2, Anxieux e Rubato" (1987), Dobrinka Tabakova's "Spinning A Yarn" (2011), Alfred Schnittke's "A Paganini" (1982), and Valentin Silvestrov's "Postlude" (1981/82). To further enhance the colors inherent in each composition, Mints and the recording team make full use of the recording studio. So at times there are passages recorded as if the violinist were at different points of the concert hall. For example, with Ysaye's work, significant phrases that are derived from Bach are played with a more cavernous sonance as if the composer were remembering Bach's music, then responding to that memory with his own compositional thoughts. The Piazzolla work was recorded close-miked to give the work a more pop sound, paralleling allusions to the popular tango strains the work plays upon. Tabakova's folksy-archaic work utilizes multi-tracking so that Mints can play the hurdy gurdy part as well as the part for solo violin. What makes it all work is that there are subtle sonic shifts and they are used sparingly at the proper times. Mints plays conversely with great passion or a ruminating quietude according to what the score calls for. It is music of wide dramatic contrasts that both Mints and the audio team capture with elan and verve. Every work here is in its own way a gem. Time is a factor throughout, whether quoting from Bach, Paganini or alluding to folk strains or popular tango melodies. In one way or another the past and the present interact continually. Mints has a beautiful sound and a great deal of technique, all of which is put to work to realize the special sonic worlds in each work. Roman Mints gives us a hands-down winner! Recommended. The Dublin Guitar Quartet sound so good I want to join them, even if it is to carry around their guitar cases (roadies in an acoustic group such as this have a lighter load). Seriously though, their album The Dublin Quartet Performs Philip Glass (Orange Mountain Music 0092) is like a baker's dozen, that surprise extra item that rounds out and completes some of the good things this summer. There are four guitarists playing classical guitars. That you might have gathered since it is on this page today. They transform four Glass string quartets (numbers 2, 5, 4 & 3) to make of them something very much "other". The music is not uninteresting to begin with--some convincing examples of Glass's beyond-pure-minimalism period, written from 1984 to 1991. The Dublin Quartet's artistry make them sound not only idiomatic for guitars, they give you an arsenal of expressive guitar transformations in the service of the music, so much so that your ears wake up in a very good way. They sound bravura, delicate like a koto ensemble, muted, with harmonics, in full strummed voice, and quite a bit more. They almost sound unearthly. It makes me like the music very much. The passages played the way they are on four guitars sound quite a bit more exotic and interesting than for the standard strings--though I'll admit I have not heard these works played by a string quartet. No matter there because I can get an idea while listening to the Dublin group playing it all. They do a marvelous job translating the music for guitars. This is a group as expressive, disciplined and poetic as any I've heard in the four-guitar realm. The album is a marvel! If you consider the entire output of composer Ernest Bloch (1880-1959), there are multiple stylistic niches. Dalia Atlas' liner notes to today's CD remind us, and it's true. There of course is the Jewish-tinged Bloch, which is the most well-known through such works as Schelomo. But there are other aspects, rather neglected since his death--the neo-romantic and impressionistic, the contemporary, church-oriented music, etc. The CD at hand centers around his last symphony: the Symphony in E flat Major (Naxos 8:573290). The Royal Philharmonic Orchestra is well in-hand throughout, as conducted by the aforementioned Dalia Atlas, a Bloch aficionado who has done much work to research and revive many now almost forgotten works. Indeed, in addition to the contemporary modern symphony from 1954-55, we get "Two Symphonic Interludes" (1939) from his opera Macbeth, which was composed from 1903 to 1910 while Bloch was still a resident of Geneva. (He came to the US in 1916, residing there permanently until his death.) The style is neo-romantic/impressionistic and the music has much charm. The symphony is a major work with great atmospheric depth and an acute orchestrational dimensionality. Atlas and the Royal Philharmonic give us a near-ideal reading. "In Memorium" (1952) is a short and somber work in a quasi-church-mode style, an elegie in memory of pianist Ada Clement. The "Three Jewish Poems" (1913) give us a prime but perhaps not as well-known example of his Semitic side. The suite was written in memory of his father. It integrates Jewish tonality into a symphonic orchestral scheme in ways that epitomise the composer in this vein. It is a fitting conclusion to a fascinating program, of a Bloch we hear far too little of today who yet still sounds apt and current. Hats off to Ms. Atlas and the Royal Philharmonic for giving us an important addition to the Bloch discography. The music bears your attention and reminds us that there indeed is more of worth in his 30-work orchestral output than just the few blockbusters we tend to hear repeatedly. All those who already appreciate Bloch will I do not doubt learn to love these works on a few hearings. It is a significant addition and at the Naxos price, you get much more than your money's worth! Recommended. Anybody who knows something of the history of classical music ancient-to-modern probably is familiar with the fact that composer Carl Philipp Emanuel Bach (1714-1788) was in his lifetime considerably more famous than his father Johann Sebastian Bach. Nowadays of course that is the reverse case. But then Johann was considered somewhat "old hat" while CPE was au courant, a central figure in rococo-to-classical period music, a hero of the modern world of music at that time. If later reception history has not favored CPE as much as Johann, it doesn't mean that CPE was not highly influential and it does not mean his music can not speak to us today. If it were not so, why would anyone produce a monumental project that is now complete and ready for our ears? I speak of the 26-CD (!) 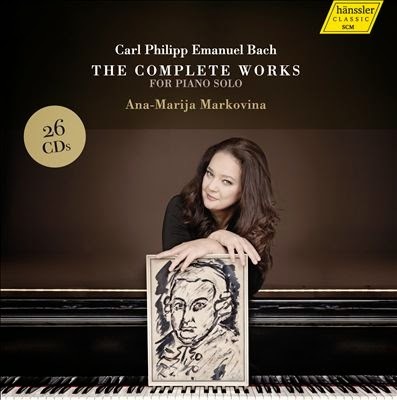 set of CPE's Complete Works for Piano Solo (Hanssler Classic) as played by pianist Ana-Marija Markovina. Now mind you, I have not listened to all 26 volumes. But I know already a fair amount of the music and I have listened closely to the sampler. And from that I hear some gloriously expressive piano performances of some wonderful music. Ms. Markovina gives the music the loving attention it deserves. She brings out the proto-romanticism, the high expressions of CPE, something that both Mozart and Beethoven learned much from. Like Haydn in his "sturm und drang" and last periods, there is music here that prefigures what is to come, a depth of feeling and a sometimes heroic lyrical strength that was not the norm of the era, certainly. What followed he had something important to do with, as you hear in concentrated form in the piano works. Perhaps most importantly this is wonderful music from a major composer of the era, now finally getting his due. Based on what I hear in the sampler the full set should be a revelation, a must for all thorough connoisseurs of the era and what followed. We perhaps now have even more evidence why his music was so well-appreciated in his day, though of course nothing will take away the exceptional excellence and our present-day appreciation for his father. The son was glorious in his own way. This set promises to set things straight in terms of his pianistic output. An exceptional project with, I have every reason to believe, an exceptional result! 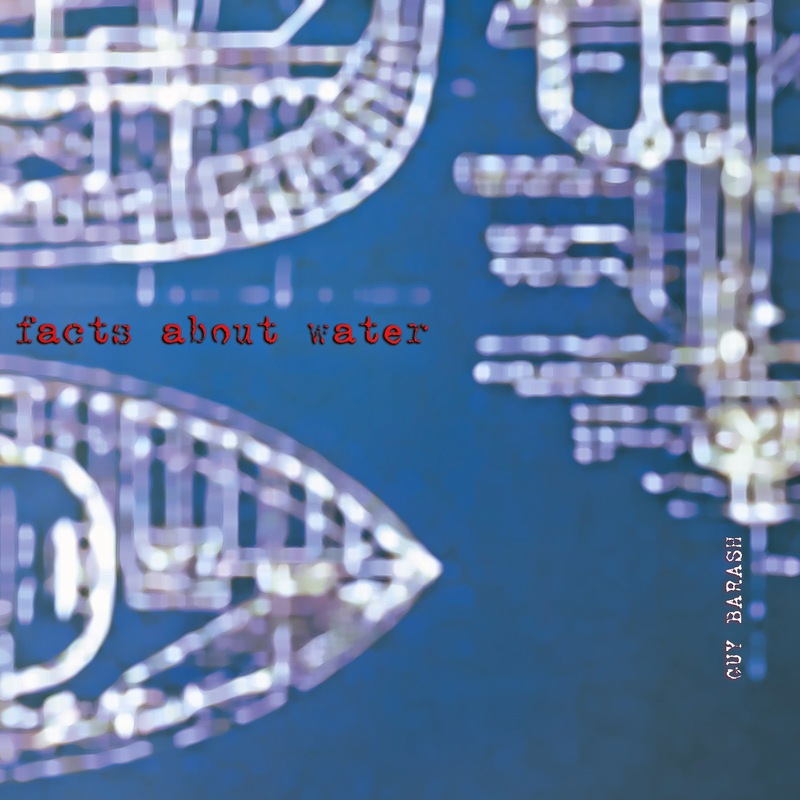 If, Bwana is an avant garde new music conflagration formed by Al Margolis in 1984. They have a couple of new releases out, and we cover today the 23-minute EP Water, Flowing (Pogus, DL only). It is an exercise, a poem in long tones that suggests flow. Single tones alternate with unisons where one of the voicings is a microtone off to create a beating of the sound. Actually there are two parts, "Flowing" and "Water". The latter thickens the texture with more multi-voiced tones that form complex dissonances in minor seconds. They are juxtaposed with long, single tones and unison beating tones depending on the moment. I hear saxophones and clarinets in the mix. The dissonant clusters give off multiple-beatings that transform the sound so that you get the feeling you are listening to electro-acoustic components in the clouds of tone. But this I believe is created wholly out of conventional acoustic instruments and the acoustic properties of the tones themselves sounding together--without being subject to any acoustical processing. It gets one's attention and holds it there with the deceptively simple means from which it begins and out of which it grows. If you revel in unusual avant music that has singular purpose and a trajectory of realization that gives you sound elements to ponder and internalize, this one will give you something to do that with. If, Bwana can always be counted upon to be provocative, experimental, and a force on the avant new music fringe. They continue that here. Is this for everybody? Probably not. It's more for the confirmed avant listener.